Internet websites with databases, indexes, or eBooks documenting the early residents of the U.S., extracted from the Nationwide chapter of Censuses & Substitutes Name Lists (Family Roots Publishing Co, Orting, WA, 2017-2018). Using the PDF eBook version of this Insta-Guide, which is currently FREE with purchase of the laminate version, every website address is hot linked to the Internet - just one click away. 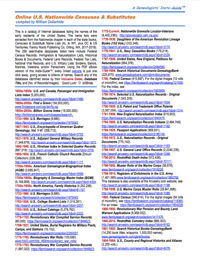 The 258 databases listed here include Censuses and Census Substitutes, i.e., Name Lists derived from Federal Census Records, Immigration Lists, Historical Books & Documents, Land Records, Federal Tax Lists, National Vital Records, and U.S. Military Lists (including Lists of Soldiers, Sailors, Marines, Veterans, and Pensioners). Together, all of the databases listed have billions of searchable records/images. Keep in mind that one record/image may have dozens of names on it. Use these databases to locate the name and residence of an ancestor or relative anywhere in the United States. The databases are identified by their inclusive dates, the name of the database, and the number of records/images in each.